Jesus was entering a village when Jesus’ mother, Mary and Mary’s sister, Martha came to welcome Him into her house. Mary and Martha are different. Mary loves to sit down beside Jesus’ feet and listened to Him preach. Martha loves to serve the Lord. Martha is distracted with busy sweeping the floor, preparing food for the guests, and serving the Lord. Jesus began to preach at Martha’s home and Mary sat down at Jesus’ feet to listen to what He said. But Martha was busy serving the Lord because of so many guests. Mary was cooking the meals for Jesus’ disciples and welcoming the guests. And she didn’t care about coming to listen to what Jesus was preaching. Martha was unhappy that she was left with so many works to do and her sister, Mary didn’t come and help her. 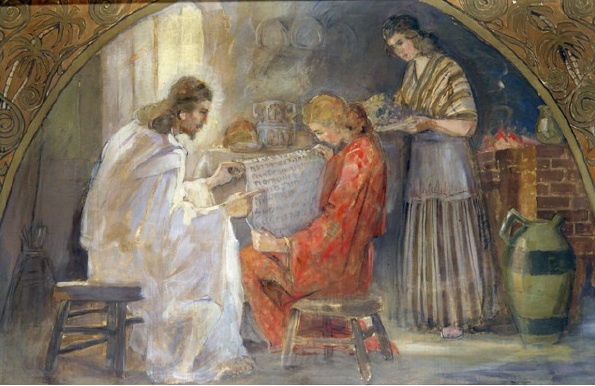 Martha was busy supplying all the needs for her guests but Mary had chosen the best part which is the holy word, and faith of Jesus Christ which will never be taken away from her.